Chrysler showed off four models of its 300 flagship sedan at a gathering in Boulder Thursday evening. Parked out front of the Rembrandt Yard Art Gallery & Event Center for 30 members of the Rocky Mountain Automotive Press were the 300 Limited, 300S, 300C and 300C Platinum. A larger grille dominates the front end of the new 300. 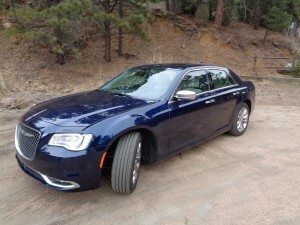 With Bob Sweeney and Donald Bain as passengers, I drove the high-end 300C Platinum edition several miles up Boulder Canyon, then several more miles up Four Mile Canyon west of Boulder. The fully loaded Chrysler, equipped with all-wheel drive, was powered by a 3.6-liter Pentastar V-6 and 8-speed automatic transmission, which is shifted with a rotary selector. To maintain more secure control in the sharp turns on the steep climb up the Four Mile roadway, I used paddle shifters for 2nd and 3rd gears. As full-sized cars go, the Chrysler is a good handler, and the V-6 power is strong. Bain and Sweeney each took their turns in the driver’s seat on our descent into Boulder and around the University of Colorado campus before returning to the Rembrandt Yard for dinner. The 300C Platinum tops out at $50,175. Base prices are $31,395 for the Limited, $34,895 for the sporty S, $37,895 for the C and $42,395 for the C Platinum. Andy Love of Chrysler Brand Marketing, Detroit, listed the Toyota Avalon, Chevrolet Impala and Ford Taurus as chief competitors for the 300, though neither the Avalon or Impala offer all-wheel drive. Thirty-two percent of Chrysler 300s sold in the 2014 model year were equipped with all-wheel drive. More than 50 percent of those sold in Colorado are AWD models. For 2015, only the V-6 models will be available with the AWD feature. The Hemi V-8, with 363 horsepower, is of rear-wheel-drive configuration. Chrysler 300’s AWD uses an active transfer case and front-axle-disconnect system aimed at improving fuel efficiency. It transitions between rear-wheel drive and all-wheel drive with no driver intervention. When AWD is not needed, the front axle is automatically disconnected to maximize fuel economy. The Chrysler 300 attracted my attention a few months ago, so I was interested in your comments on it. I had made a mental note to myself to check this car out whenever we were ready to buy again. Our 2007 Impala LTZ was in good condition, so I felt it would be some time before we’d change cars. But then the dealer called to inform us they had 2014 Impala LTZs and they were offered at a price that Wally felt we couldn’t pass up. And as you know, we bought another Impala.